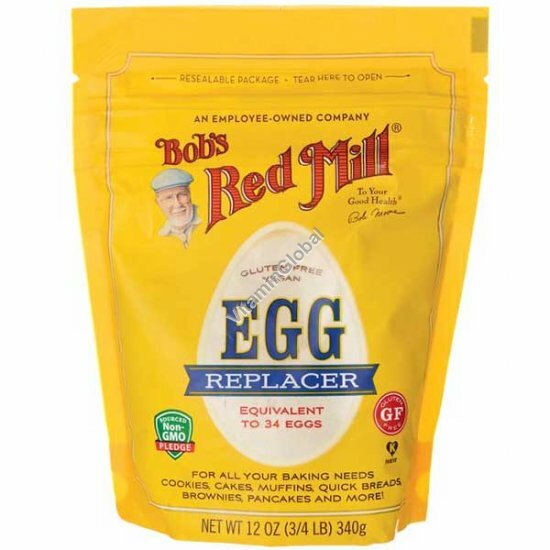 Bob's Red Mill Gluten Free Egg Replacer is a vegan baking essential made with four simple and clean ingredients: potato starch, tapioca flour, baking soda, and psyllium husk fiber - no grains, soy, gluten, or beans. This proprietary powdered egg substitute is the perfect ingredient for egg-free baking and can be used in cakes, cookies, muffins, pancakes, quick breads, and more. It's so easy to use: just add water in varying amounts depending on if you are replacing an egg white, yolk, or whole egg. With each package containing the equivalent of 34 eggs, it's an economical choice as well. A great choice for those watching their cholesterol intake as it is cholesterol free! Produced in our dedicated gluten free facility, it's safe for celiacs and is perfect for use with our gluten free baking mixes! Just don't try to scramble it or make an egg white meringue - it's fantastic but it's not magic! Check out our recipes tab for more ideas on how to incorporate our vegan egg replacement into your favorite dishes.